Patients in endemic areas with chronic pulmonary and mucotaneous lesions involving the mouth, nose, larynx, and face; regional or diffuse lymphadenopathy. Found in Latin America, from Mexico to Argentina. Dimorphic fungus: yeast form in tissue specimens and at 37 °C; mold form when grown at room temperature in the laboratory. Thick-walled yeast, 4-40 um, with multiple buds when seen in tissue specimens. Paracoccidioidomycosis is caused by Paracoccidioides brasiliensis. Also known as South American blastomycosis, it is the most prevalent systemic mycosis found in Central and South America and is the most common endemic mycosis in this area. Paracoccidioidomycosis is acquired only in Central and South America and ranges from Mexico to Argentina. Most cases occur in Brazil, and fewer cases are seen in Colombia, Venezuela, Ecuador, and Argentina. In other Latin American countries, it is considered rare. It has never been reported in Belize, Nicaragua, Suriname, French Guiana, Guyana, Chile, or any of the Caribbean islands. Cases reported in nonendemic areas such as North America and Europe have occurred in patients who have traveled to or lived in the endemic areas. Within the geographic range for P brasiliensis, there is considerable variability in endemicity. It is commonly found in tropical or subtropical forests, where there are mild temperatures with little seasonal variation and very high humidity. The precise ecological niche in the environment has not been established. Soil has been postulated to be the reservoir. Nearly 95% of the cases of paracoccidioidomycosis occur in males. It is also unusual in adolescents and children. There is evidence that estrogen has an inhibitory effect on conidia of P brasiliensis, and this may explain the difference in incidence among the sexes. Inoculation of the skin was once thought to be the portal of entry; however, the evidence now suggests respiratory acquisition. There is no evidence of person-to-person transmission. P brasiliensis is a dimorphic fungus. In clinical specimens, it appears as a thick-walled yeast that ranges in size from 4 to 40 um. Multiply budding yeast cells (the so-called "pilot wheel" or "mariner's wheel" cells) may be seen from tissue specimens and are a characteristic feature. In the laboratory, when this yeast is grown on enriched media at 37°C, colonies will appear in 5-10 days. In contrast, when grown at room temperatures (19°-28°C), the mycelial form or mold will grow in 20-30 days. The thin septate hyphae can develop a variety of conidia, but induction of conidial growth can be difficult and unequivocal identification of P brasiliensis requires documentation of dimorphic growth in the laboratory. After the conidia of P brasiliensis are inhaled, fungal growth begins within the alveoli and small airways of the lungs. The yeast stimulates a vigorous neutrophilic and then macrocytic response. Spread to regional lymph nodes usually occurs early in infection. At the same time, more widespread dissemination may occur, particularly to the reticuloendothelial system. Depending on the host response, the infection may be controlled, may become clinically apparent, or may become dormant. The inflammatory response seen is a mix of granulomatous, suppurative, and necrotizing. Host response and the status of the immune system are critical determinants in the expression of disease. Both humoral and cellular immune responses are required to control the infection. Although serious infection has been reported with increasing frequency in recent years in patients with AIDS or other forms of severe immunosuppression, it is not a common opportunistic infection in these patients despite its endemic nature. The widespread use of prophylactic trimethoprim-sulfamethoxazole in AIDS and transplant patients may explain the relatively infrequent occurrence in these patients. The manifestations of infection with P brasiliensis range from asymptomatic or subacute to chronic and focal to disseminated. Although all patients are presumed to have a pulmonary portal of entry, and 80% will have evidence of pulmonary infection, not all will have symptoms that suggest respiratory disease. The majority of patients present with symptoms involving mucosal surfaces of the mouth, nose, or larynx; a variety of cutaneous lesions; or general or localized lymphadenopathy. Symptoms will vary by the extent of involvement, and sites may include the liver, spleen, central nervous system, gastrointestinal tract, and bones. Of note, like H capsulatum, P brasiliensis has a particular propensity to involve the adrenal glands. Most patients with any evidence of disseminated disease will have some degree of adrenal involvement; however, overt Addison's disease is very uncommon. Patients with respiratory symptoms will present with cough, purulent sputum production, and dyspnea (Box 6). Fever may or may not be present. Many patients will have nonspecific constitutional symptoms such as weight loss, weakness, and malaise. Mucocutaneous involvement is characterized by ulcerations in the mouth, cheilosis, and dysphagia. On physical examination, the pulmonary findings are often less prominent than would be expected based on the radiographic findings. Examination of the mouth may reveal polymorphic ulcerations. The lips may be indurated and painful. Lymphadenopathy is often present, and spontaneous drainage commonly occurs. A variety of cutaneous lesions may be seen including abscesses, nodules, papules, ulcers, and verrucous lesions. It is very common for pulmonary, mucocutaneous, and lymph node involvement to coexist in the same patient. Direct examination of sputum or lymph node drainage with a potassium hydroxide smear may reveal the yeast forms. Culture of sputum or drainage will also be positive. Blood cultures may be positive in disseminated disease, particularly among children and young adults. Serologic tests will be positive in most patients with infection. The chest x-ray will generally show diffuse bilateral interstitial and alveolar infiltrates. Less frequently encountered findings include multiple nodules, cavitation, and hilar lymphadenopathy. Calcification occasionally occurs but not as frequently as in histoplasmosis or tuberculosis. Tuberculosis may coexist with paracoccidioidomycosis in as many as one-quarter of the cases, and care must be taken to distinguish two diseases that can resemble each other. The differential diagnosis also includes histoplasmosis, blastomycosis, lymphoma, leishmaniasis, leprosy, and malignancies. Chronic untreated pulmonary disease may lead to fibrosis, pulmonary hypertension, and cor pulmonale. Chronic symptomatic adrenal insufficiency is a rare complication of disseminated disease, but adrenal function may recover after long-term antifungal therapy. 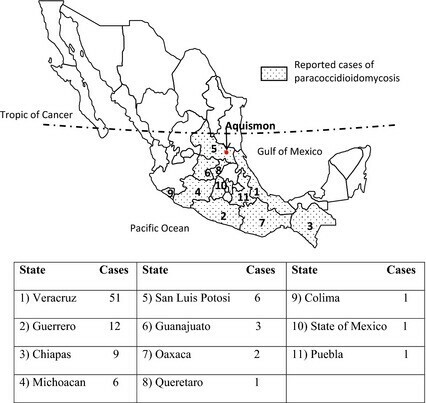 The diagnosis of paracoccidioidomycosis can be suspected when an appropriate clinical syndrome occurs in a patient who has lived or traveled in Latin America. Given the syndrome's strong propensity to become dormant and remain so for years, even a remote history of exposure in the endemic area can be considered significant. The presence of multiply budding yeast cells on direct examination of sputum or pus is presumptive evidence of paracoccidioidomycosis. These cells may also be seen on histologic examination of a lymph node or other tissue. Definitive diagnosis requires culture from sputum, pus, blood, or a biopsy specimen. Serologic tests will be positive in 95% of cases by the immunodiffusion test and 80-95% by complement fixation. The skin test for paracoccidioides is of no help diagnostically and is suitable only for epidemiological investigation. The azoles are now considered the treatment of choice for paracoccidioidomycosis (Box 7). In clinical trials, 95% of patients responded to a standard ketoconazole regimen, and 8% of patients relapsed. Itraconazole may be superior to ketoconazole, but there is less experience with this agent. A similar response rate has been observed but with a lower relapse rate. Similar findings have been noted with fluconazole. Paracoccidioidomycosis can also be treated with sulfonamides. Although the response rate is excellent, there is a relapse rate of ~ 15%. Therapy with sulfadiazine can be instituted and continued for 4 weeks until a clear clinical response is detected. The maintenance dose is continued for 3-5 years. Amphotericin B can be used in life-threatening infections or in patients who are intolerant of or have failed sulfonamide therapy. Azole therapy should follow amphotericin therapy for several months. Trimethoprim-sulfamethoxazole can be substituted for sulfadiazine in both the initial and maintenance phases of therapy and should be given lifelong in AIDS patients with a history of paracoccidioidomycosis. The prognosis for paracoccidioidomycosis is excellent when the diagnosis is established early in the course of the disease and therapy is promptly instituted. In patients with advanced disease and a wasting syndrome characterized by weight loss, fatigue, and malnutrition, the prognosis is less favorable but is enhanced by aggressive supportive care, including nutritional repletion, correction of anemia, and bed rest. Prophylactic trimethoprim-sulfamethoxazole will prevent primary or relapse paracoccidioidomycosis.